Bode diagram design is an interactive graphical method of modifying a compensator to achieve a specific open-loop response (loop shaping). 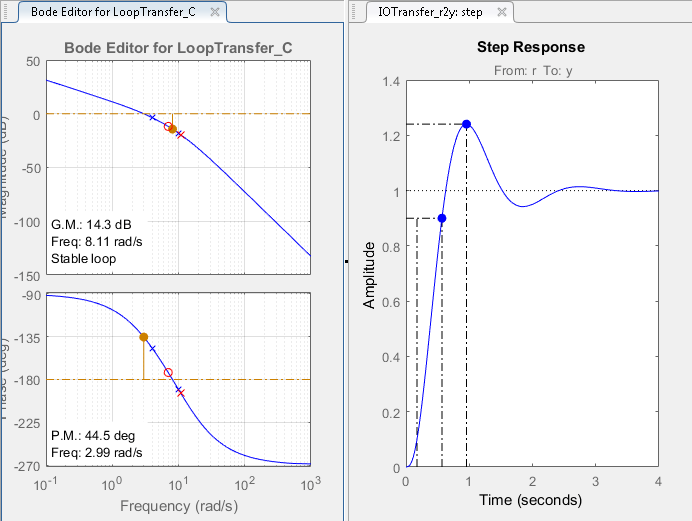 To interactively shape the open-loop response using Control System Designer , use the Bode Editor. In the editor, you can adjust the open-loop bandwidth and design to gain and phase margin specifications. To adjust the loop shape, you can add poles and zeros to your compensator and adjust their values directly in the Bode Editor, or you can use the Compensator Editor. For more information, see Edit Compensator Dynamics. For information on all of the tuning methods available in Control System Designer, see Control System Designer Tuning Methods. This example shows how to design a compensator for a DC motor using Bode diagram graphical tuning techniques. At the MATLAB® command line, create a transfer function model of the plant, and open Control System Designer in the Bode Editor configuration. The app opens and imports G as the plant model for the default control architecture, Configuration 1. 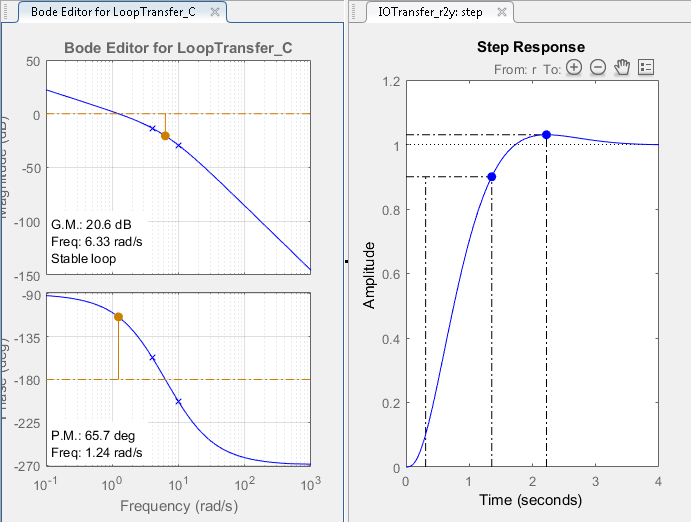 Open-loop Bode Editor for the LoopTransfer_C response. This response is the open-loop transfer function GC, where C is the compensator and G is the plant. 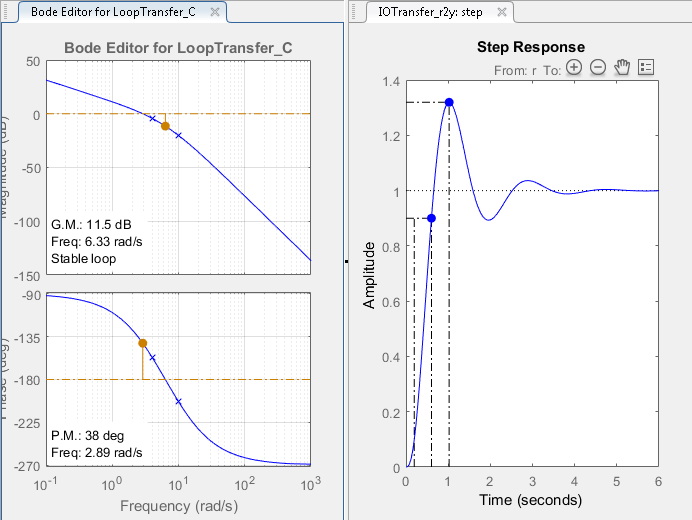 Step Response for the IOTransfer_r2y response. This response is the input-output transfer function for the overall closed-loop system. To open the open-loop Bode Editor when Control System Designer is already open, on the Control System tab, in the Tuning Methods drop-down list, select Bode Editor. In the Select Response to Edit dialog box, select an existing response to plot, or create a New Open-Loop Response. To view the open-loop frequency response and closed-loop step response simultaneously, on the Views tab, click Left/Right. 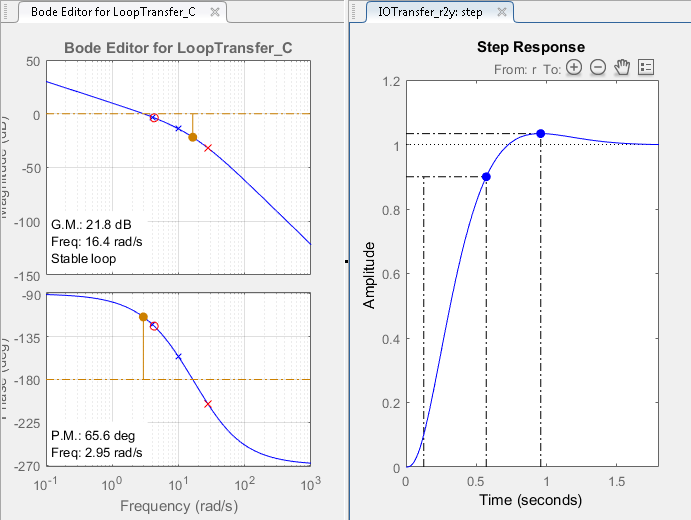 The app displays the Bode Editor and Step Response plots side-by-side. Since the design requires a rise time less than 0.5 seconds, set the open-loop DC crossover frequency to about 3 rad/s. To a first-order approximation, this crossover frequency corresponds to a time constant of 0.33 seconds. To make the crossover easier to see, turn on the plot grid. Right-click the Bode Editor plot area, and select Grid. The app adds a grid to the Bode response plots. To adjust the crossover frequency increase the compensator gain. In the Bode Editor plot, in the Magnitude response plot, drag the response upward. Doing so increases the gain of the compensator. As you drag the magnitude plot, the app computes the compensator gain and updates the response plots. 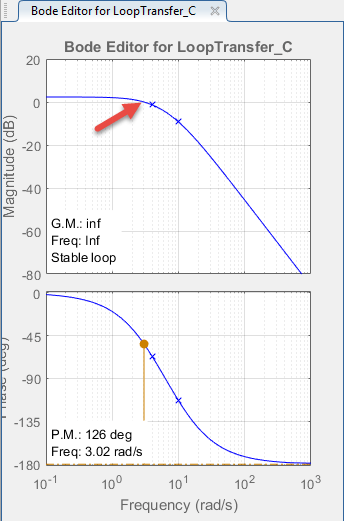 Drag the magnitude response upward until the crossover frequency is about 3 rad/s. 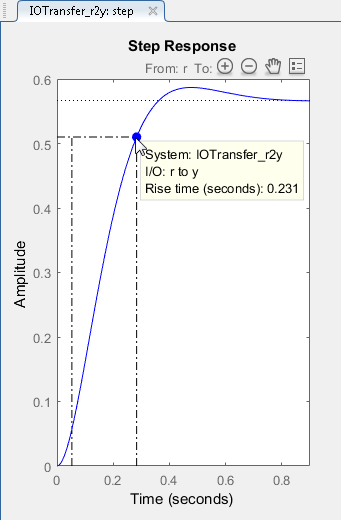 To add the rise time to the Step Response plot, right-click the plot area, and select Characteristics > Rise Time. To view the rise time, move the cursor over the rise time indicator. The rise time is around 0.23 seconds, which satisfies the design requirements. Similarly, to add the peak response to the Step Response plot, right-click the plot area, and select Characteristics > Peak Response. The peak overshoot is around 3.5%. 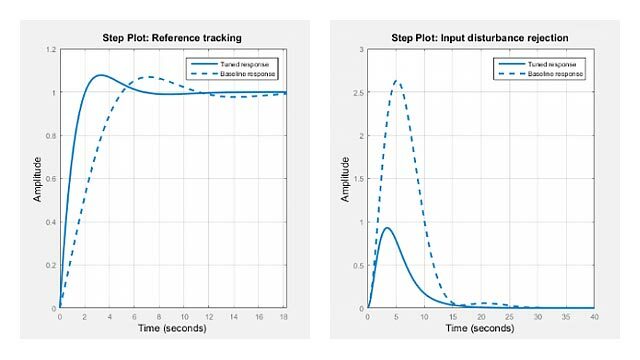 To meet the 5% steady-state error requirement, eliminate steady-state error from the closed-loop step response by adding an integrator to your compensator. In the Bode Editor right-click in the plot area, and select Add Pole/Zero > Integrator. Adding an integrator produces zero steady-state error. 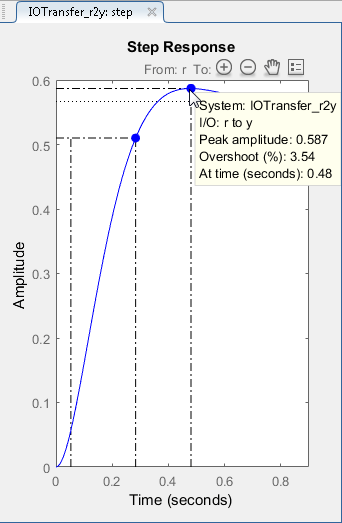 However, changing the compensator dynamics also changes the crossover frequency, increasing the rise time. To reduce the rise time, increase the crossover frequency to around 3 rad/s. To return the crossover frequency to around 3 rad/s, increase the compensator gain further. Right-click the Bode Editor plot area, and select Edit Compensator. In the Compensator Editor dialog box, in the Compensator section, specify a gain of 99, and press Enter. The response plots update automatically. The rise time is around 0.4 seconds, which satisfies the design requirements. However, the peak overshoot is around 32%. A compensator consisting of a gain and an integrator is not sufficient to meet the design requirements. Therefore, the compensator requires additional dynamics. In the Bode Editor, review the gain margin and phase margin for the current compensator design. The design requires a gain margin greater than 20 dB and phase margin greater than 40 degrees. The current design does not meet either of these requirements. To increase the stability margins, add a lead network to the compensator. In the Bode Editor, right-click and select Add Pole/Zero > Lead. To specify the location of the lead network pole, click on the magnitude response. The app adds a real pole (red X) and real zero (red O) to the compensator and to the Bode Editor plot. In the Bode Editor, drag the pole and zero to change their locations. As you drag them, the app updates the pole/zero values and updates the response plots. To decrease the magnitude of a pole or zero, drag it towards the left. Since the pole and zero are on the negative real axis, dragging them to the left moves them closer to the origin in the complex plane. As you drag a pole or zero, the app displays the new value in the status bar, on the right side. As an initial estimate, drag the zero to a location around -7 and the pole to a location around -11. 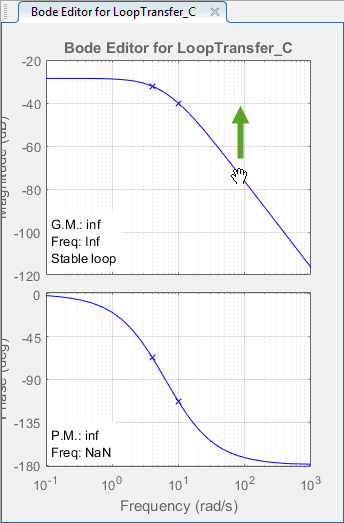 The phase margin meets the design requirements; however, the gain margin is still too low. To improve the controller performance, tune the lead network parameters. In the Compensator Editor dialog box, in the Dynamics section, click the Lead row. 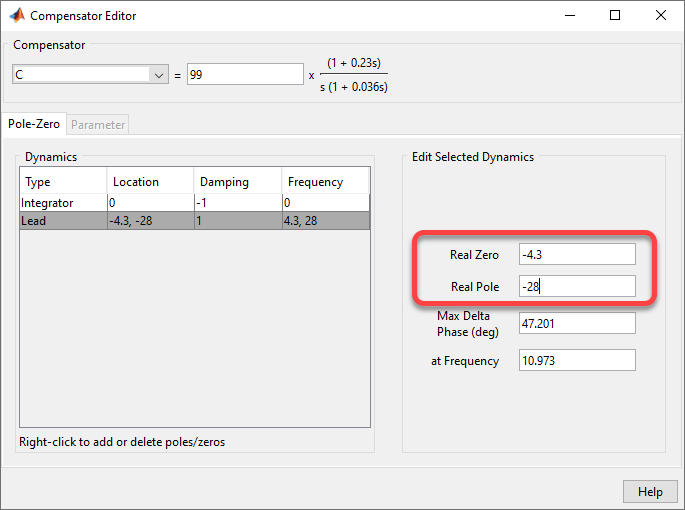 In the Edit Selected Dynamics section, in the Real Zero text box, specify a location of -4.3, and press Enter. This value is near the slowest (left-most) pole of the DC motor plant. In the Real Pole text box, specify a value of -28, and press Enter. 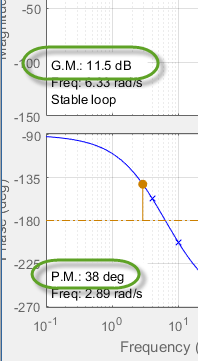 When you modify a lead network parameters, the Compensator and response plots update automatically. In the app, in the Bode Editor, the gain margin of 20.5 just meets the design requirement. To add robustness to the system, in the Compensator Editor dialog box, decrease the compensator gain to 84.5, and press Enter. The gain margin increases to 21.8, and the response plots update. Rise time is 0.445 seconds. Gain margin is 21.8 dB. Phase margin is 65.6 degrees. The system response meets all of the design requirements.